Blend 1/2 tsp red food color, 1/2 cup confectioners sugar, and 1 tbsp milk for a cranberry glazed icing. Easter Egg Dyeing: Add 1 tsp vinegar and 1 tsp red food color to 1/2 cup boiling water. Dip hard cooked eggs for 5 minutes or longer. Chinese Red Pork: Combine 1 cup salt, 3/4 cup sugar, and 1/3 cup Chinese Five Spice. Mix well. Add 1 1/2 tsp Red Food Color and combine to distribute color. Coat 5 lbs. pork tenderloin or pork loin with mixture. Cure on a rack for 6 hours. Roast pork in a 350°F until 155° internal temperature is reached. Recipe makes 24 3 ounce servings. 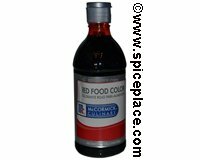 Ingredients in McCormick Red Food Color: Water, Propylene Glycol, FD&C Reds 40 & 3 and Propylparaben (as a preservative).